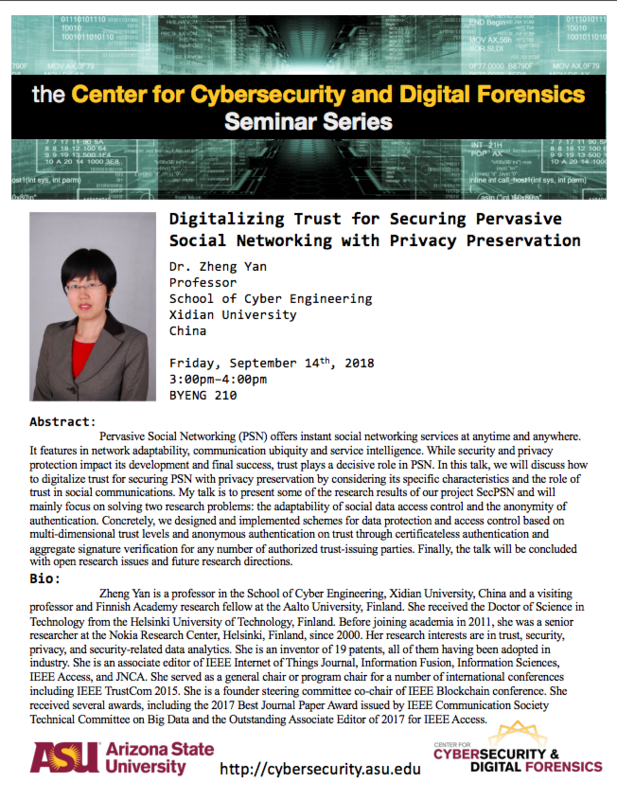 Learn about Pervasive Social Networking and how building trust is critical to it at this seminar presented by the Center for Cybersecurity and Digital Forensics Seminar Series. Pervasive Social Networking offers instant social networking services anytime and anywhere. It features in network adaptability, communication ubiquity and service intelligence. While security and privacy protection impact its development and final success, trust plays a decisive role in PSN. 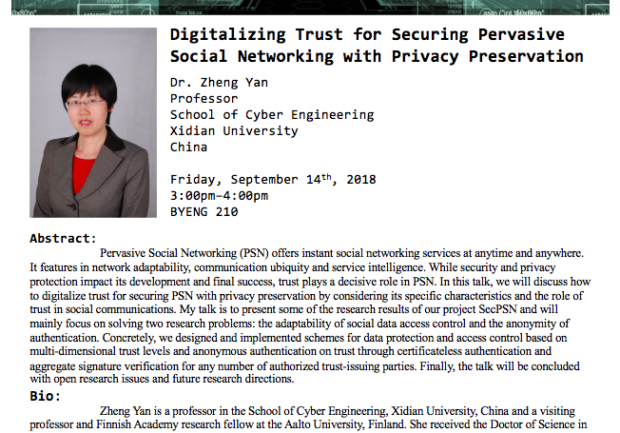 In this talk, Zheng Yan discusses how to digitize trust for securing PSN with privacy preservation by considering its specific characteristics and the role of trust in social communications. She will present the results of the project SecPSN and will focus on solving two research problems: the adaptability of social data access control and the anonymity of authentication. Concretely, they designed and implemented schemes for data protection and access control based on multidimensional trust levels and anonymous authentication on trust through certificateless authentication and aggregate signature verification for any number of authorized trust-issuing parties. Zheng Yan is a professor in the School of Cyber Engineering, Xidian University, China and a visiting professor and Finnish Academy research fellow at the Aalto University, Finland. Before joining academia in 2011, she was a senior researcher at the Nokia Research Center, Helsinki, Finland for ten years. Her research in trust, security, privacy and security-related data analytics. She is responsible for 19 patents, all of them having been adopted in the industry. She is an associate editor of several journals and has served as a general chair or program chair for a number of international conferences. She received several awards, including the 2017 Best Journal Paper Award issued by IEEE Communication Society, Technical Committee on Big Data and the Oustanding Associate Editor of 2017 for IEEE Access.